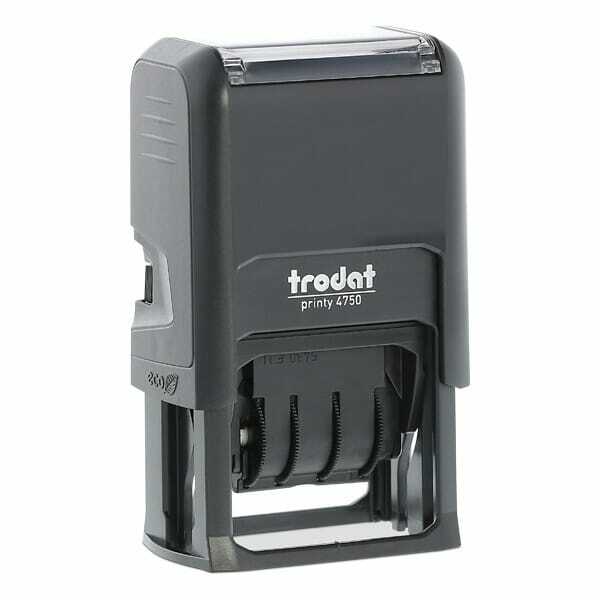 Trodat Printy 4750 Numberer creates a rectangular 1" x 1-5/8" (24 x 41 mm) impression, which can include a maximum of 2 lines of customized text alove and below the printed numbers (6 number bands). Chosen text can be added effortlessly online using the built in design platform. To further extend the life of your stamp, order the suitable replacement ink pad 6/4750 - available in black, blue, red, green, violet - or 6/4750/2 two-colored blue/red. Customer evaluation "Trodat Printy Numberer 4750/6 1" x 1-5/8" - 1+1 lines"